Millennium Recycling String Lights? Not in the bin. String Lights? Not in the bin. If you’re ready to toss those broken or worn down christmas lights, don’t chuck them in the recycling bin! Luckily for Sioux Falls area residents, the City’s Household Hazardous Waste facility will recycle Christmas tree lights for free. If they’re still functional, you can also donate them to local thrift stores. Why not trash your Christmas String lights? 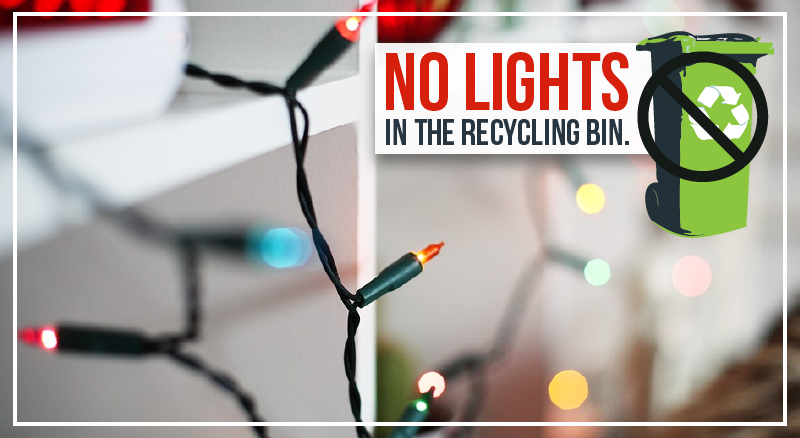 It may be easier to throw your old holiday string lights in the trash, but they are not made for the landfill. Not only do they take up precious landfill space, but there are materials like copper and plastic that can be recovered – it’s wasteful to throw them in the trash. Why not put them in the recycling bin? Many people confuse the recycling bin with a place to throw everything that can be recycled, reused, or composted. WRONG! That bin is only for single stream items (aka bottles, tubs, jugs, paper, cardboard & metal cans). Any other item can contaminate materials, ruin the equipment, or just end up as trash (and cause way more work for the people pulling it out). String lights are one of the big No-No’s of the recycling bin because they are a double hitter: First, they are “stringy“, meaning they can wrap around the equipment and completely shut us down! Second, they are technically e-waste, which should be recycled by a specialized e-waste processor, not your recycling bin. Any questions? Just Ask! We love to see your questions on our Facebook page as well. We’re here to help! Marketing, Communications & Education Millennium Recycling, Inc. Flood Cleanup: Please not in the bin! Keep VHS Tapes Out Please! There are 0 comment. on "String Lights? Not in the bin." Is Recycling Still Worth It? Yes! Recycling Is Worth It And Is Here To Stay. Celebrating 20 Years! Watch our story. Serving Sioux Falls and the upper Midwest since 1999, we recycle a wide variety of materials from residential and commercial generators. Our goal is to continue driving the recycling rate up through education and innovation. Fill in the field and hit Enter to Search. Looking for a specific item? Go to the Where Do I Take This Page.